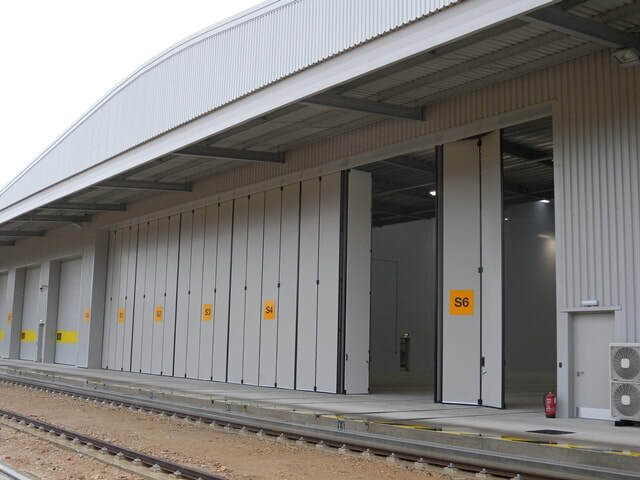 ​Specialist industrial door manufacturer Jewers Doors have installed several of its Phoenix range sliding folding doors at Hitachi’s new UK rolling stock manufacturing centre at Newton Aycliffe. Although the industrial doors to the production unit had to be aesthetically pleasing and reflect the style of the modern high tech manufacturing plant, practical issues such as closing around live overhead electrification lines (OLE), multiple rail tracks to cross, integration with the building management systems and the need for doors to open externally in all conditions had to be considered. At the front of the building, Jewers installed four of its latest generation Swift-SEW bi-folding doors, specifically designed for the rail industry. Each comprises four highly insulated, single piece composite panels, with two leaves folding to each side on the outside of the building. Leaves are operated by a newly developed high power centrally mounted drive unit which incorporates inverter control for smooth start and stop and takes less than 10 seconds to open the door fully. Operator safety is ensured with full height pressure sensitive safety edges and photocell beams to create a safe zone around the door. Each door closes around an OLE and when open leaves are locked in position with powerful mag-locks to prevent wind-damage. In the event of power failure, a low-level disengage handle enables effortless manual operation in just 2 seconds. 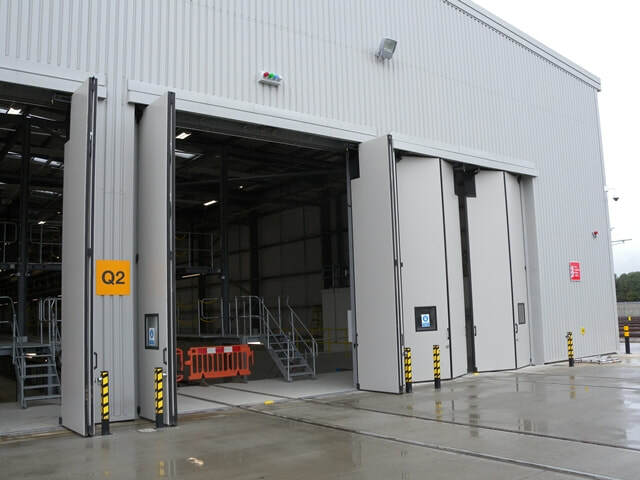 At the rear of the plant, Jewers designed, manufactured and installed a 25 metre Osprey multi-leaf sliding/folding door to work in unison with an external ‘traverser’ train moving system. Partially finished trains leave the building on one rail track and via one section of the Osprey door, are then moved along to the next production bay via the traverser system and re-enter production via another section of the door. In total, the door is configured in six sections and crosses six railway lines. Whilst Osprey doors have a top and bottom track as standard, the key to this door was that it couldn’t incorporate a continuous bottom track, had to be accessible to all rail lines at any time and be future-proof in accepting wider rolling stock at a later date. Access to each rail line is achieved by manually opening individual door sections, which are secured in place with lockable full height espagnolette bolts also acting as the pivot point for each pair of leaves. The espagnolette bolt incorporates a bottom guide, which when withdrawn, enables door leaves to be moved aside to allow access for wider vehicles. All Phoenix doors are manufactured from single piece, fully insulated panels with CFC-free polyurethane core to optimise thermal efficiency and reduce noise pollution by up to 25dB. The panels are seamlessly fitted with multi-wall rubber seals to all edges to reduce water, air and dust ingress and all hardware is maintenance-free.